Whether it’s May Day, Mother’s Day, or someone’s spring birthday, these cards are so simple to make and are really adorable. What’s even better is the kids can help make them, too! Even my wee tot got into making lovely watercolor washes and then going on a nature hunt in the yard for any fresh spring flowers to use. What a great way to make something special and spend some quality time with your child! Start by making the background to your spring flower cards. Offer your child a sheet of white construction paper and a small cup of water. Now encourage your child to cover her paper with the water using a big paint brush, making sure the entire paper is wet. Time to get spring-y! Get out the watercolors and invite your child to paint over the water-covered paper using bright spring colors such as yellow, orange, purple, and green. Your child can watch what happens with the paint when it is painted over the watery paper. The colors blend and wash together, creating a really cool effect! She can use small brushes to create detailed lines and dots, or big brushes to make sweeping areas of color. Once she’s satisfied with her watercolor creation, allow the paper to dry for an hour or so. While waiting, head outdoors on a nature walk looking for any fresh spring flowers or leaves to use for the cards. We used some lavender and some pretty-pink petaled flower for ours! Now she can cover the flowers with black tempera paint and press them on top of the dry watercolor paper creating a flower print! After the prints are dry, she can cut around the flowers and glue them to the front of cards – perfect for giving to any special loved one or friend. 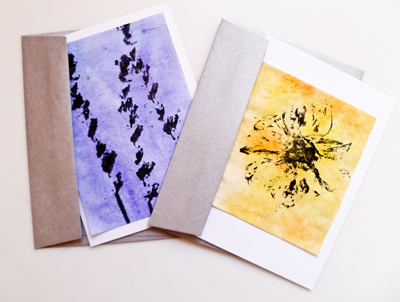 Make the finished spring flower cards even better by tossing a handful of seeds in the card before mailing!